We offer four tin sizes plus a plastic “tin”. All tins include a magnet. 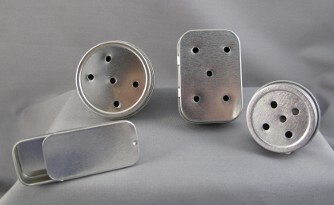 The metal tins have a 3/4″ x 1/8″ adhesive backed, super strong, rare earth magnet attached to the inside of the tin. 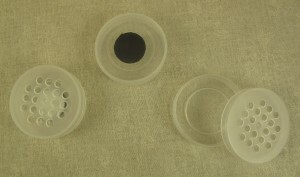 The plastic “tin” has a self adhesive .12″ thick magnet attached to the outside. If you prefer tins without magnets, please contact us. We are always willing to do a custom order.